Lead generation campaigns are the lifeblood of a company. They help connect the company with buyers from across the marketplace to drive sales and enhance brand recognition. It’s the reason that lead generation campaign failure is so damaging for growing B2B companies. Your lack of online visibility is impacting your ability to attract leads. Without an active social media profile, a refined SEO campaign, and a pinpoint PPC strategy, you’re unable to locate and convert your prospects. Make sure you build your digital marketing blueprint to maximize the return for online marketing investments. Many of the tactics you’re using within your lead generation campaigns are likely outdated. If you’re stuck using trade shows, radio advertising, and other traditional media tactics, it’s time to change strategy. Commit to online content syndication and marketing automation as a way to empower your sales team. Testimonials capture the attention of customers and drive trust in a brand. But your testimonials might be sending the wrong message. Ensure your content, such as testimonials and case studies, is created according to your brand goals for the long-term. Many companies fail to build their sales enablement process. They don’t offer sales teams the training, the tools, or the support to achieve their goals. By altering how you manage your sales team and providing them the resources they need, you can achieve lasting returns in terms of lead generation. 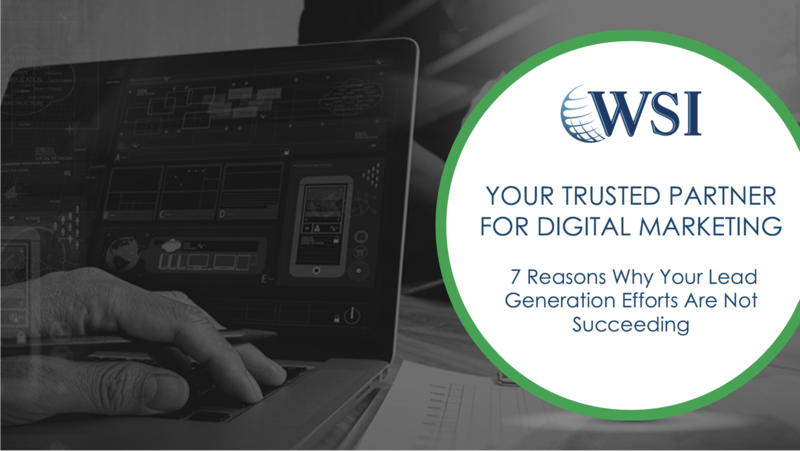 You can learn more about the leading solutions to these common lead generation issues within our latest seminar, which will take place September 25th at 11 a.m. Register for the “7 Reasons Your Lead Generation Campaigns Are Not Succeeding” seminar today!